When reading about the bail bond business, I came across stories about women bail bond agents. I thought my main character, Ruby Dark, would be more interesting than a standard male bondsman in the rough-and-tumble world of bail bond agents. I tell the story from the viewpoint of Ruby's nephew, a night-school law student named Jason. I liked using Jason as a foil for several reasons. One, he's new to the bail bond business, so I can use his lack of expertise to explain things about the business the reader needs to know. Second, Jason sees himself becoming more of the prosecutor type of lawyer, so philosophically he and his aunt conflict at times. Third, seeing Ruby through her nephew's eyes is a way to further emphasize her mysterious past. Jason Piszek attempted to suppress a yawn as he answered the phone, but failed miserably. He wasn’t sure how long he’d been asleep. Not long enough, that was for sure. In his brief tenure as a licensed bail bondsman he’d wearily come to realize that success was less a matter of business acumen than a test of sleep deprivation. Friday nights were the worst—every lost soul in Denver got arrested on Friday nights. Bruce W. Most loves to read and write classic whodunits. He grew up on a diet of Agatha Christie, Ellery Queen, and his grandfather’s collection of Perry Mason books. Many mystery readers love figuring out the puzzle, and Bruce believes in playing fair with them. His favorite mystery writer is the great Raymond Chandler, who he pays homage to in his award-winning mystery, MURDER ON THE TRACKS, about a 1949 Denver cop who finds that redemption comes at a high price. His award-winning ROPE BURN involves cattle rustling and murder in contemporary Wyoming ranch country. Yep, cattle rustling still exists. 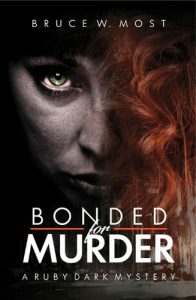 He also is the author of two mysteries featuring a feisty Denver bail bondswoman Ruby Dark: BONDED FOR MURDER and MISSING BONDS. As a former freelance writer, he published in such magazines as Parade, TV Guide, American Way, Popular Science, Popular Mechanics, and Travel & Leisure. He ghost wrote a self-help book, The Power of Choice, and wrote over 1,000 articles on financial planning topics for the Financial Planning Association. He and his wife live in Denver, Colorado, where he enjoys travel, photography, tennis—and golf if he’s playing well.